Google Voice is a free enhanced telephone management service that works with your existing phone number and carrier, or all on its own. It includes features you want but will never get from a telephone carrier service because carriers can't make money off them. Take caller-blocking, for example. Carriers make money by the talk-minute, so they don't want you to block any callers. Google Voice is free, so it lets you block callers by caller-ID. Think of all the people from whom you never want to hear again. With Google Voice, you won't. Phone number portability is another highly desirable feature that phone carriers don't want to offer. Many charge $5, $10, even $15 to transfer your phone number to one of their competitors. If you get a Google Voice phone number, it's yours for life free of charge. Forward it to any phone carrier's number you like and when people call your Google Voice number, they reach you. Change carriers and leave the old carrier's number behind. Just forward your Google Voice number to the new carrier's number. No charge. Carriers charge you to listen to voicemail, even charging for the time you spend navigating their deliberately complicated voicemail command menus. Google voicemail can be set to automatically forward a WAV file of a voice message to your email inbox, where you can listen to it in one mouse click. It can even transcribe voicemail into a semblance of English, although this feature is as imperfect as any text-to-speech application. SMS text messaging on a phone is tricky with those tiny buttons or imprecise touchscreens. With Google Voice you can send text messages to any SMS-enabled phone number from a full-sized keyboard. Text message conversations are threaded just like Google Mail so you can keep track of the back and forth exchange. You can search text messages just like you search email. You get one recorded greeting with most phone carriers… "Hi, this is X, please leave your message…" With Google Voice you can store multiple greetings customized for individual callers or groups of callers. Have one greeting for business contacts; another for friends; one for each of your loved ones; etc. You don't even need a phone service carrier to use Google Voice. You can't make outbound calls but you can receive voicemail, and both send and receive text messages via your Google Voice phone number. Add a free or low-cost Internet phone service such as Skype for outbound calls and you have a complete telephony package for nothing or very close to it! A Google Voice number also does conference calls; lets you hear who is calling before you answer (call screening); lets you download voicemails and forward them via email as embedded or attached files; record calls and store them online. It treats voice data just like any other data, allowing virtually unlimited flexibility in how you store, process, and manage it. With a Google Voice account, you gain features that phone carriers won't offer or will charge hefty fees to provide. You have one phone number permanently, no matter what number you are actually "at". Simply put, Google Voice simplifies mobile communications, for free. Most recent comments on "What Is Google Voice?" The blocking, screening, and other features of Google Voice (GV) would be great for future phone number submissions to various entities and new people that you give the GV phone number to but what about all of the entities that have your old phone number now? I'd like to block a credit card scammer that keeps calling every few days but they have my regular phone number so I can do nothing about it. Porting my home phone number to GV as Larry, in his Dec. 7, 2009 suggested, sounds like an option that would make GV omnipotent and omnipresent. EDITOR'S NOTE: You are correct. But last month I'm sure that I signed up without needing an invite. Perhaps they are limiting the numbers until all the kinks are worked out. You can visit https://services.google.com/fb/forms/googlevoiceinvite/ to request an invite. Well, I think that the functionality is way over my head but I requested an invite! Google sure has some unique features! I use 1-800-GOOG-411 MANY times a week and that is one way to make free calls (to businesses). When I got my Droid, I found that Google Voice is already on there, so they are rolling it out without invitations now. Been using it since I finally received my invite back in the summer. I'm the president of a local not-for-profit snow ski club, and in addition I put together and run ski trips. My Google Voice number is for my ski club business mainly. I advertise this number for sales promotions, etc. That keeps my personal home phone number from being broadcast. GV also allows me to screen calls when they come in, either by accepting, sending to voice mail, or by listening in to the voice mail as it's being recorded and then either accepting or allowing the call to continue to voice mail -- similar what the old style answering machines still allow you to do. And using only one number with GV allows me to ring any number as mentioned, and I can customize when (hours of the day and days of the week) those calls will ring those other numbers. Not to mention the FREE phone calls to any of the 50 states, and the transcribing of my voice mail and sending it to my e-mail immediately, it's just fantastic to use. I could go on and on and on...so many great features. Have to second the request for clear label if things are US-only. I live in Japan and enjoy your zine. I love Google voice. OCD people like me love the control. Mr. Rankin . . . Google Voice is The B-O-M-B! I have been using the service for quite some time now and haven't even started using all the features you just described. However, I recently had to BLOCK two people and it Works Wonderfully! I do NOT work for Google BUT Thankfully they ARE looking out for those of us who don't have much money to be fooling around with Ma Bell and their ilk! I personally use the MagicJack(tm) and let me be Clear: It and Google Voice Go hand-in-hand, perfectly! I don't usually Recommend Stuff but these 2 things I do - - For Sure!!! Absolutley love it. I use it for all our long distance now. Free for all US calls and only $.02 minute to UK land lines where all the family lives. We gave the number to our friends and they now only have to dial one number and all three of our phones ring simultaneously. I do not have the caller-ID feature on my home phone. Will G. Voice still allow call blocking on my home phone? EDITOR'S NOTE: Yes! But you have to get a Google Voice phone number, which will ring your home phone. The call blocking would only work when people call the GV number. Is there any way to use Google Voice without a computer on? my wife and i have been using it (seperate google voice accounts, for both of our land-lines) for several months. we love the free, domestic long distance calls. haven't tried out too many of the "bells and whistles", yet - but will probably get around to some of them eventually. i'm told that it can even be handy for cell phone users (as long as they have a computer with them), since they make their google voice number one of their "circle" of of friends or family. doing so allows them to keep from eating up minutes on their monthly cell phone plans. it's also very easy to use. highly recommended! Can anyone tell me if Google voice works in Australia? The best feature is unlimited calls on your cell phone as long as you have a plan that gives you a list of numbers that you call the most for no charge(friends and family). You list your Google voice number as one of the numbers you can call free and all the calls you make with your Google voice number are not counted against the minutes you pay for on your plan. 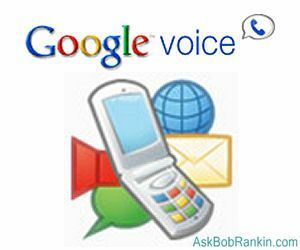 You can talk all day free as long as you use the Google voice number to make the call. Pretty sweet. Modify the numbers in your contact list to be the Google voice number, a pause, your password, a pause, the number 2, a pause, and the number to call. Thousands of minutes a month for free. Thanks Google. I love GV and got a number very shortly after it became available. My only problem is that when I receive a call, that is when it sends the call to my home phone the incoming message gets clipped - it starts playing when the phone is answered and by the time I have it to my ear its telling me what to push. I haven't found a way to 'pause' the message for maybe 2 seconds, and don't know why this isn't a problem for others. I have looked into this great service and I see it says "by invite only" to get GV. Is this normal?. Is this what you must do to get GV?. Great info here however. Thanks! Hmmm, After I click through the "Google invite", it says it's only available in the USA...Is this true?. Google Voice is indeed pretty awesome. I have moved a lot in the last few years, and the biggest complaint I get from friends is that they are constantly having to change my phone number in their phones and phone books. And of course, no matter how diligent I am about notifying everyone of a phone number or email change, many never wind up getting around to noting it, and then we lose touch. I went with Google Voice for the same reason I went with Gmail: no matter how many times I move, my contact info will always remain the same. So I don't need to rely on others to insure that I remain connected to them! There are SOME bugs still involved with GV, but overall, it's great. My bf is in Germany at the moment, and I've found that, although calls are available cheaply to Germany, SMS at the moment is not. But after having read the forums on GV, it looks like that is gradually changing. For those chagrined over the fact that GV is only available to the US, I'd say just be patient. No doubt, it'll be available to the global community soon! Why don't they make this available in Canada??? We lack so many things up here. i.e. XM radio service is expensive, like our cell phones more expensive service too. It is infuriating to live on the same continent and be deprived of so many things. Oh Canada!!! I have a need to make calls without blocking but to show a number that is not my actual number is that makes sense. Also , if I use this do I have to dump my phone company I am currently using ?